When the weather’s hot, iced green tea is a healthy, refreshing drink that helps you cool down—and you don’t need sugar, sweeteners or even a kettle to make it. Here are three brewing techniques you can use to make iced green tea. This technique does require a kettle and is best for when you need a quick cuppa. Have cold water and some ice on hand to serve. Prepare your tea as you would prepare a hot green tea (we recommend water at 60-70°C) but use double the amount of tea than usual. This is because you are making a kind of ‘concentrate’ that you can then dilute with cold water. Using more tea increases the flavour whereas extending the brewing time increases astringency, so let the tea brew for your usual infusion time. Pour the liquid into a larger jug. If you’re feeling a little adventurous, grab another jug and pour the tea from vessel to vessel—this increases the air around the liquid and cools it down faster. To serve, top with cold water equivalent to about a quarter of the total amount and add ice. The tea should now be cool and refreshing to drink. This style of infusion has all the benefits of green tea and retains the flavour that you love from a hot brew, but without the warm feeling you get from drinking one. You should be able to use the leaves at least once more for another round. This technique needs more time than hot and cold infusion so start about 6-8 hours in advance of when you intend to drink you iced green tea. It’s more convenient to use a teapot with an infuser in it, but if you don’t have one, use any container you can close. Ideally, this container should be glass, ceramic or porcelain as plastic and metal tend to add unwanted flavours to the tea. As with hot and cold infusion, you will need more tea than you usually have in a hot brew. 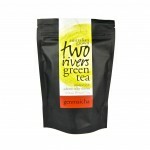 Because cold water does not extract as much flavour as hot water, you need more tealeaves to achieve the same level. If you’re going to drink it straight, 50% extra is fine, but if you’re having it ‘on the rocks’ we recommend doubling the amount. If using a teapot with infuser, place tealeaves in the infuser and insert infuser into the teapot. If using another container, place tealeaves in the container directly. Fill the teapot/container with cold, fresh water and leave it in the refrigerator for 6-8 hours. Close the teapot/container for this time so it doesn’t absorb other scents from the fridge. When it’s ready, remove the infuser or filter the tealeaves out of the liquid and serve. If you don’t want to drink it right away, transfer the tea to another vessel to keep—we suggest eight hours as a maximum brewing time because after this point the tea becomes robust instead of refreshing (but if you like it that way you can keep the tealeaves in as long as you like). The main benefit of the classic cold brew method is that the green tea will never become astringent, which is a common complaint against green tea when brewed incorrectly. You will also notice a clean mouthfeel that helps the tea work its magic on a hot day. It will taste a little different and contain less caffeine than the hot version, however, because hot water extracts flavour and caffeine differently compared to cold water. You should be able to reuse the leaves for another two brews, just increase the steeping time by 1-2 hours each subsequent round. 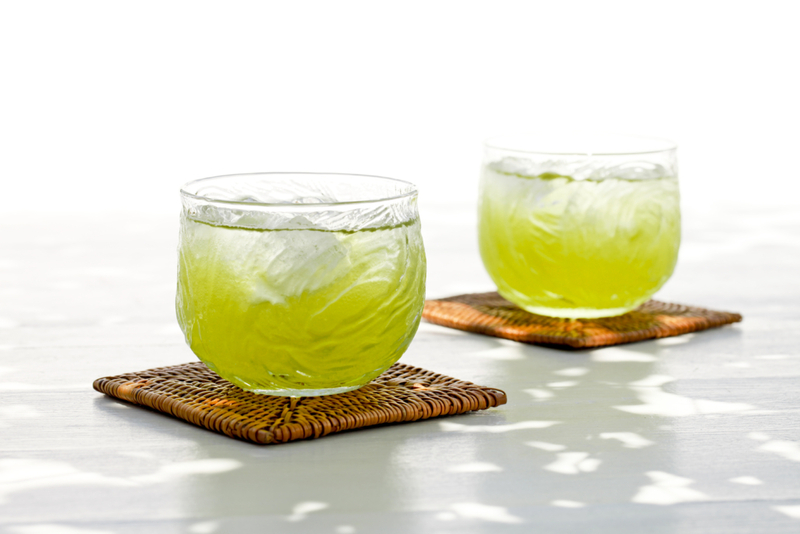 Brewing tea over ice is called kooridashi in Japan and is perfect for high quality green tea, like our shincha. Place the tealeaves in a glass, ceramic or porcelain vessel, then cover the leaves with ice. Cover the vessel. The amount of tealeaves to ice should be about one teaspoon to about 50-100mls of ice. Leave the vessel at room temperature. When the ice melts, strain the leaves out and drink. Unfortunately, it can be difficult to tell how much water is in an ice cube because water expands when frozen and there’s such a big range when it comes to ice cube shapes and sizes. As a result, this technique may require a bit of personal experimentation to perfect the ratio of tea to ice cubes. The other important thing to remember is to make sure you use good quality ice; for example, if you usually use filtered water in your tea, use filtered water for your ice. When using ice from your home freezer, you may want to rinse it in case it has absorbed aromas from other items. Ice brew often brings out the scientist in tea drinkers because the time it takes for the ice to melt will vary according to the size of the ice cubes (many small ice cubes melt faster than fewer big ones even if they hold the same volume of water), the ambient temperature (ice brew in the sun will differ from ice brew in the refrigerator, of course) and how well the vessel conducts heat. What you will get is a true iced tea with plenty of flavour but without astringency and you can use the tea leaves for a hot or cold brew another 2-3 times.